Teaching With Love and Laughter: A Whole Lot of Random Info! 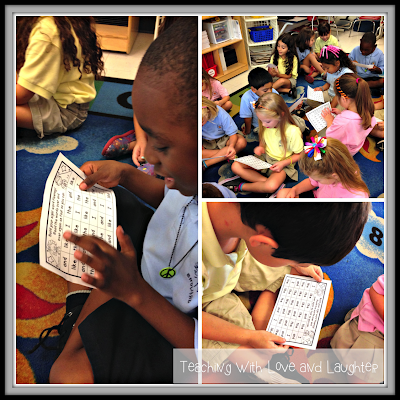 We are building our sight word fluency! My students ask to do this every day. 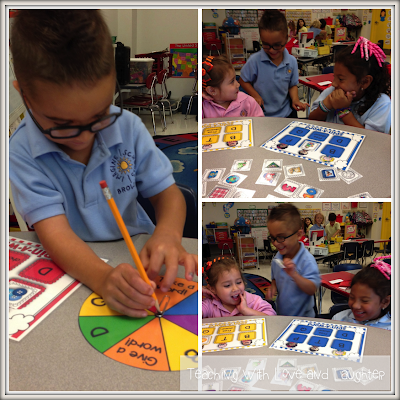 They love to sit and read their weekly sight words over and over again. 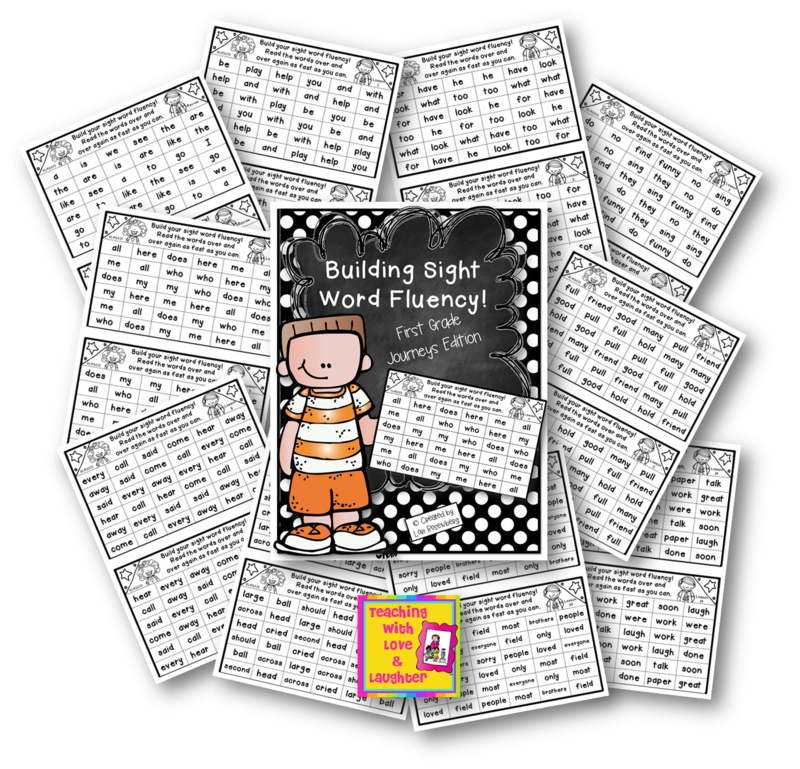 This is truly helping them remember and recognize the words when they see them elsewhere. 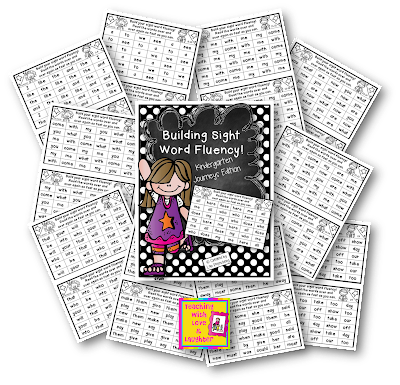 I highly recommend having your students practice their sight word fluency. I made sight word fluency sheets to follow the Journeys reading program. You can find the first grade pack here. And the kindergarten pack here. Kindergarten is also enjoying Spin-a-Word...Beginning Sounds Edition. 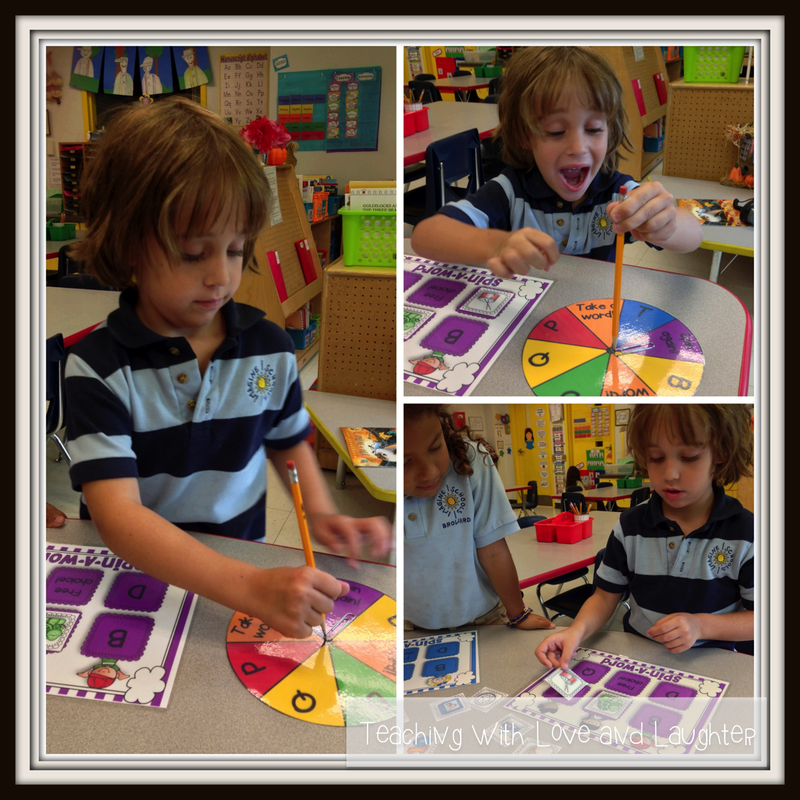 I introduced it during my small groups a few weeks ago and now they can play it during station time. I think I did a great job capturing the excitement of this game! LOL! In the above sequence of pictures, the handsome gentleman landed on take a card, and was trying to decide who to steal a card from! What a tough, but fun decision to make! 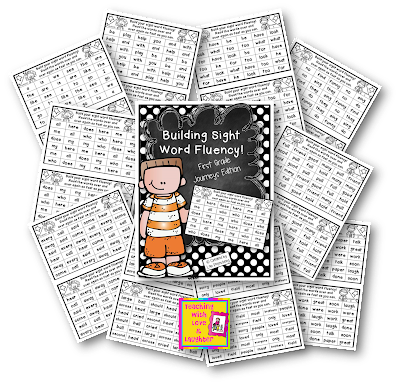 You can check out all my Spin-a-Word games here. This week, we read the cute book Mice Squeak, We Speak, by Tomie dePaola. 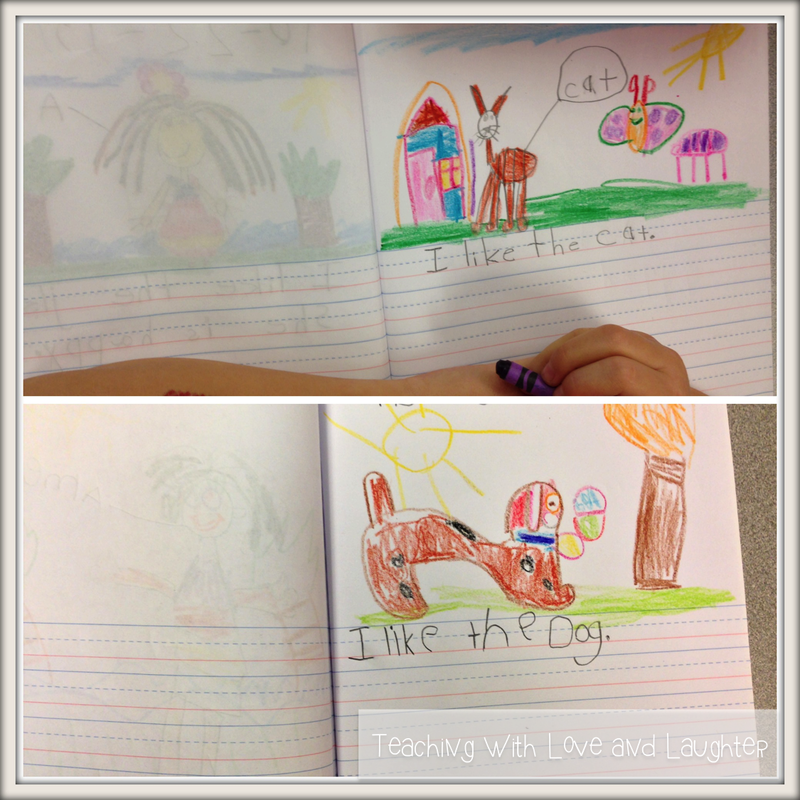 The children chose their favorite animal from the book and drew a picture of it. Then, they wrote a sentence. They are getting more and more comfortable writing words and sentences, and I am so happy about that! The last picture I want to show you, is of my listening station. It used to be at a table, but I needed the table for my new Sentence Station. I had this extra cart hanging around (don't all teachers have one or two hundred extra carts hanging around at all times?) I am loving this new set up. It doesn't take up much room and the children are way more comfortable now because they can sit with the cord behind them and enjoy listening to the story without the cord in their way. I highly recommend this set up! You can even keep your book review sheets on the shelf, along with some pencils and crayons. Oh, one last thing! The LUCKY winner of my Brag Tags Giveaway was chosen the other day, but, she hasn't contacted me yet. If you are Jennie M., please contact me by Friday or I'll have to choose a new winner. Thanks so much! 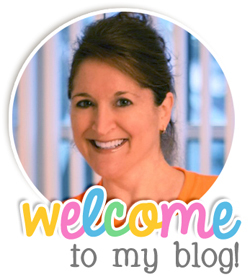 Boost Promotions, the maker of the Brag Tags, is eager to hear from you too! Seriously, these tags are such a HUGE motivator. 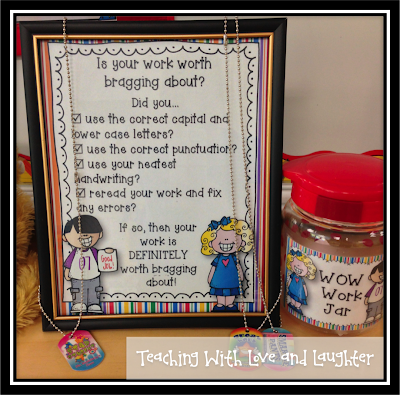 Coupled with the Wow Jar, I can't begin to tell you how hard my students are working at making sure they are always producing their personal best. And, I feel like I can be really picky about their writing because they really, really want their names in the jar as often as possible. They get a little disappointed when they don't earn a ticket (which is just them writing their name on a piece of scrap paper), but they are always learning from their mistakes. If you didn't read about my Wow Jar, please click on the image below! 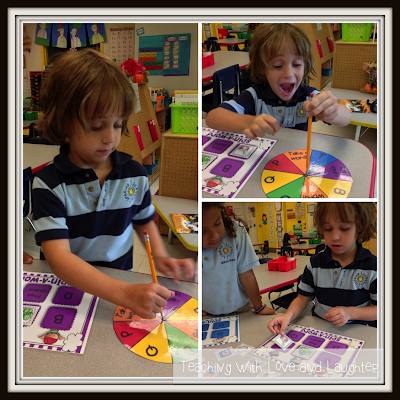 Love the kids face in the spin game! Great capture! 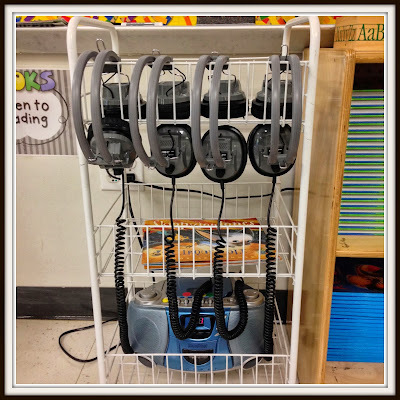 I also have that same exact cart you used for your listening station, but I currently use it for the students to place their agendas, daily logs, and homework in as they arrive each morning.....now you've got me thinking! 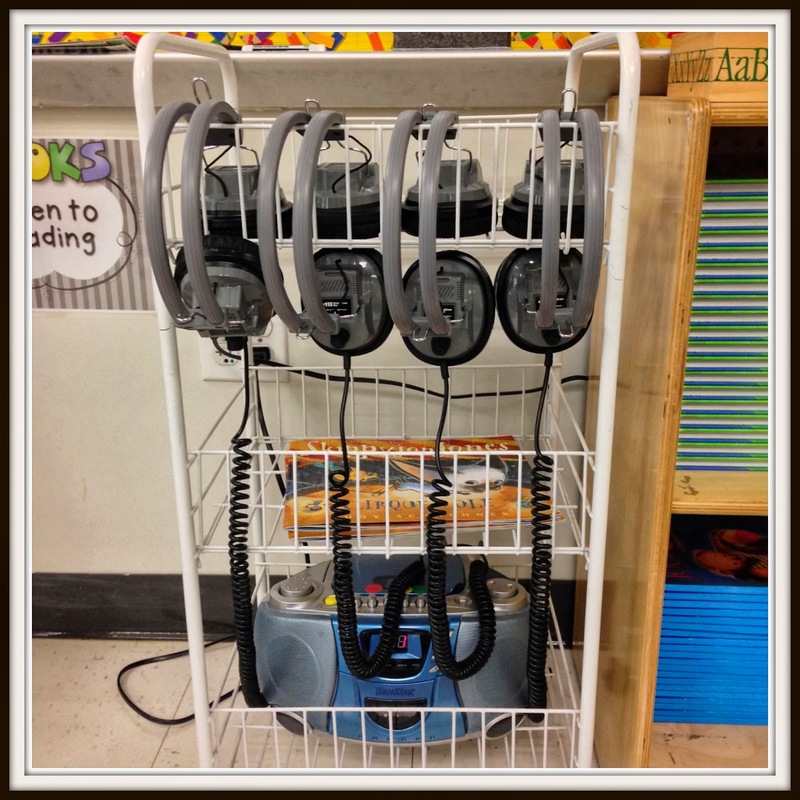 How fun is that listening center!!! I love your cart for the listening station, can I ask you where did you get it? I need one like this. I bought the cart at Walmart several years ago. I love it!